Perennial with long narrow, dark green leaves with linear veining. 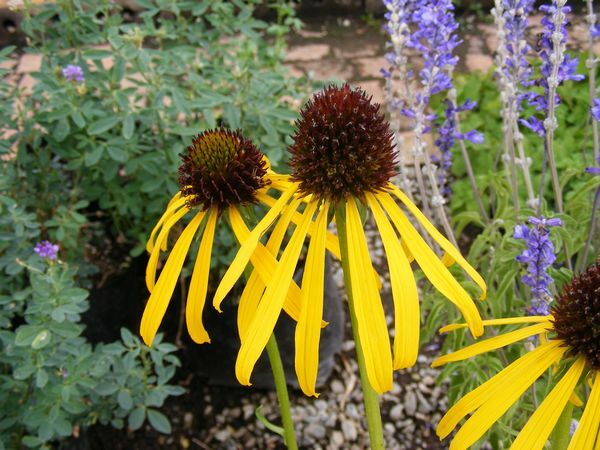 Bears large, daisy-like flowers with drooping yellow petals and very large, coppery-brown to chocolate-brown central cones. Needs full sun and soil pH 6.6 to 7.8 (mildly alkaline). Divide clumps when they become overcrowded. Plants usually re-bloom without deadheading, however prompt removal of spent flowers improves general appearance. May self-seed if at least some of the seed heads are left in place. Attractive to bees, butterflies and birds. Deserves a place in both medicinal and ornamental gardens. Harvest mature flowers in midsummer, pick leaves any time. All 9 species are medicinally important and all parts of the plant have some activity. It may be used as an anti-microbial anywhere in the body. It activates macrophages, increases white blood cell levels and inhibits the enzyme that causes host cells to break down. Echinacea is often used as a short term immune stimulant (2 weeks maximum), but it is contraindicated in auto-immune system disorders and progressive diseases.